National public opinion polls consistently find overwhelming support for labeling food with genetically engineered (GE) ingredients. Yet most Ohio legislators are reluctant to act on that mandate, perhaps because little state level data has been available on the attitudes of Ohioans. To address this lack of information, the Ohio Ecological Food and Farm Association (OEFFA) conducted a state-wide poll to understand Ohioans’ opinions about the use of genetic engineering technology, gauge consumer awareness of the presence of GE food in supermarkets, and measure the extent to which Ohioans feel GE foods should be labeled. 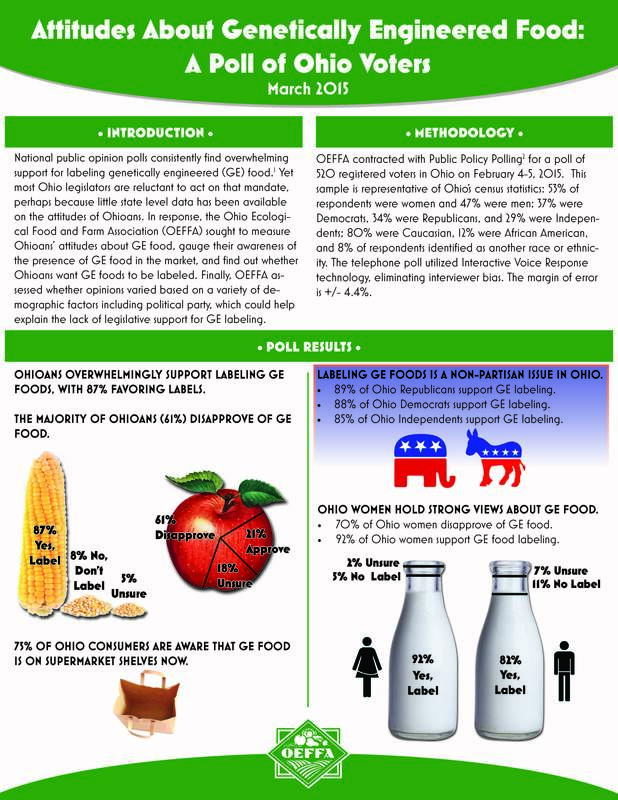 A poll of 520 registered Ohio voters conducted in February 2015 illustrates strong support for labeling food that contains GE ingredients. View OEFFA's 2 page issue brief summarizing the poll results here. Read OEFFA's press release here. View an infographic depicting the results below (scroll down to see the entire image). Sign our petition to the Ohio General Assembly in support of GE labeling in Ohio. The success of our policy work relies on OEFFA's dedicated members, who are leading the way to strong and healthy local food systems. For more information about OEFFA's policy work or to get involved, contact policy@oeffa.org or (614) 421-2022 Ext. 208.